Living the Dream @ Deer Run: Mini MoFo February 2017 - SOMETHING RED! Mini MoFo February 2017 - SOMETHING RED! Hello dear ones. We are in the throes of high season over here, so no video this time. We got a nice Mini MoFo prompt to post "something red." Easy peasy once again. So, those are double chocolate waffles done strawberry shortcake style. I used So Delicious CocoWhip, with organic berries, organic fair trade shaved chocolate; everything about those waffles is organic and fair trade. You can do this too.... choose your own recipe and toppings and get to it. It's hard to see, but that tiny red bowl is the CUTEST thing going.... I got it at the local thrift, it's hand painted with tiny hearts all through the inside, even signed by the artist on the bottom, from Italy! Fifty cents! These are mini bundt cakes using a recipe I think from Minimalist Baker, I used organic ginger ale instead of stout. 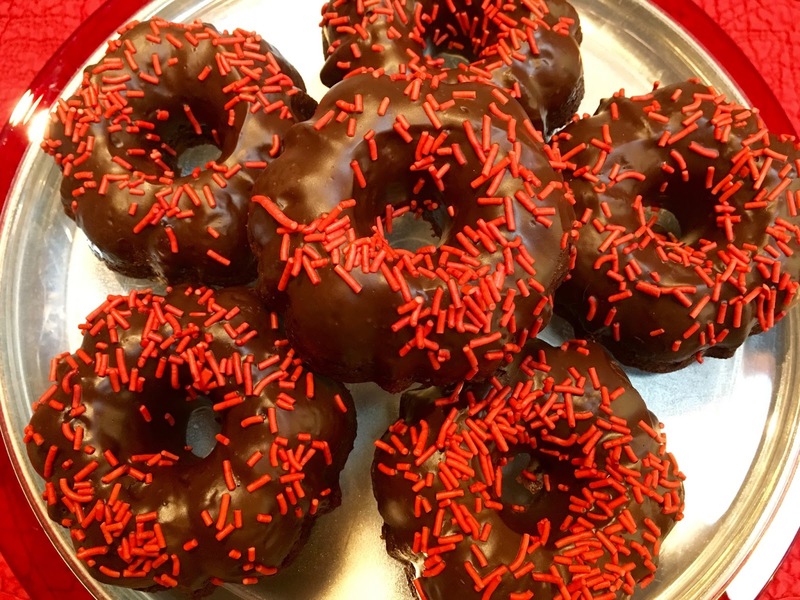 I dipped each one in my own ganache and sprinkled with red vegan sprinkles. I made the cutest toppers for each cake, but was (as usual) very pressed for time so the best I could do was slap these bad boys into boxes and call it a day. We had a beautiful Valentines breakfast for our guests with heart shaped white chocolate strawberry muffins, Love Potion #9 beverages, pink smoothies, fresh fruit, Valentine cookies for all, and mini cakes. I learned the hard way that these larger sprinkles have a relative low melt point, so never again will I coat my sugar cookies before baking if using the large sprinkles. I'm pretty new to this line of sprinkles (Sweetopolita, on Etsy, she has an entire vegan section). They are really great variety and brightness, but they are no good for the baking situation which is why no pictures of the sugar cookies. There it is, short and sweet... something red. Vegan for the win as always! I'm so jealous, it looks like you treated your guests very well indeed! I love the sound of the white chocolate and strawberry muffins too.